Eastside of the motte with the fosse visible to the right. At the end of February I took a walk out to the Motte and Bailey at Glascarrig. This historical site is located where Diarmiud Mac Murchada, anglicised Dermot MacMurrough, landed in 1167 on return his from Wales. MacMurrough, the King of Leinster had lost his Kingdom to the last High King of Ireland Rory O'Connor. He had travelled to England to recruit the help of Henry II to recover his Kingdom. After sending troops in support, which included Richard de Clare AKA Strongbow and Raymond le Gros, Henry later sent a bigger force to keep Stongbow and his knights in check. The Norman invasion of Ireland was starting taking place. Raymond le Gros was granted Glascarrig and either le Gros or his nephew William Caunteton constructed the motte and bailey castle. 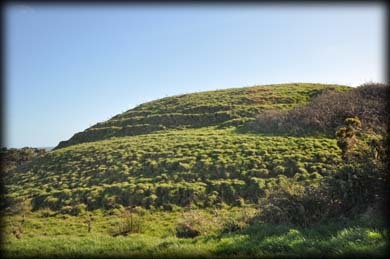 The 6 metre high motte has a flat top where a wooden castle once stood. 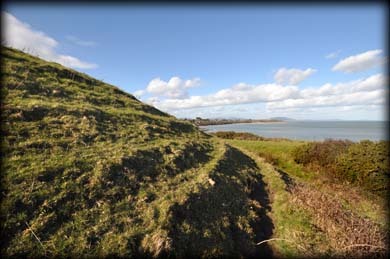 The bailey was at the southern side if the motte and is defined by a west bank and a gorge at the south, the eastern side of the fosse and bailey are sadly being eroded by the sea. The Cauntetons and founded a Benedictine Priory at Glascarrig towards the end of the 12th century. Situated: From Ballygarret head north on the R742. After 750 metres turn right for Glascarrig. Go 1.8K to the end of the road and park. Either ask at the last farm on your right or head north along the beach where you can see the motte above the cliff. On private land. Discovery Map 69: T 2138 4959. Last visit Feb 2015.